The imprinting of crosses is a practice that is found at many holy wells. It is a simple, yet lasting action that seems to speak to the heart of these pilgrimages. 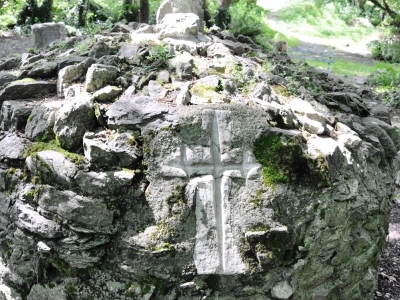 The engraving of crosses at particular spots is an established part of doing ‘the rounds’ in some cases, as is found at St Gobanit’s Well in Ballyvourney or ‘the City‘ near Rathmore. These simple features are tangible forms of continuity, as successive pilgrims, over time, have worn the shape into the hard stone. However, there can also be newer crosses found indicating that personal variations are leading to development of supplementary practices. 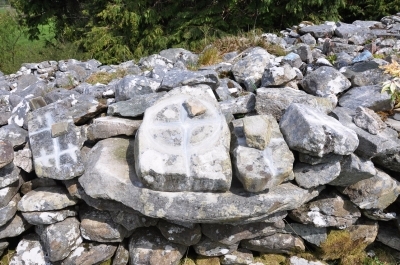 A single cross is worn into the large capstone on St Gobnait’s Grave; the grave is a station on the turas which is circled several times and stopped at for prayer. 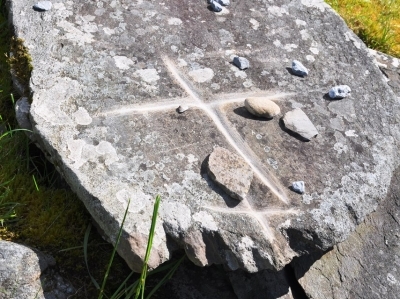 Crosses are imprinted into four rocks at the Eastern prayer Station in ‘the City’ as part of the rounds. The crosses are manifestations of faith in the places and the intercessory power of the patron saints. Each cross was forged as pilgrims performed these local pilgrimages for particular intentions: cures and hopes, dreams and problems, worship and thanks. The action of making the cross, which wears down further in the stone each time, is intimately linked the motivations of each pilgrim. The gap that is the cross – the distance from the depth of the imprints to the rock surface – is not an eroded void, but a space willed with supplications, prayers and beliefs. These intentions and beliefs remain embed in these sites as the physical geography, cultural tradition and spiritual practices combine in these simple forms. 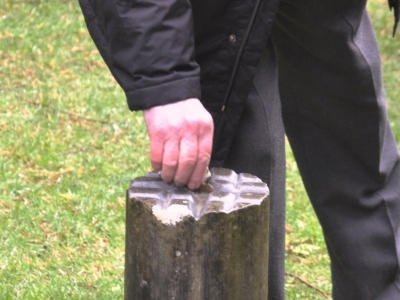 A pilgrim engraves the shape of a cross as part of the rounds at St Gobanit’s shrine.